A medical examiner, a detective, and a former neighbor tell the stories that connect them to serial killer Jeffrey Dahmer. At a fish store, Jeffrey Dahmer watches piranha feed before going home with goldfish for himself. Dahmer then stops at a hardware store to examine the size of a trash receptacle. Dahmer is also depicted going about an average life that includes having an eye exam, purchasing bleach, and drinking beer. His second murder is covered via dramatization of the night and following morning at a hotel with his victim. Documentary segments focus on three interviewees. Apartment neighbor Pamela Bass recounts life in the building before and after the discovery of Dahmer’s crimes. Medical examiner Jeffrey Jentzen details the forensic investigation. Detective Pat Kennedy covers Dahmer’s interrogation and confession. “The Jeffrey Dahmer Files” is a documentary that focuses on three individuals with unique connections to three different stages in the crimes of the notorious serial killer. Former neighbor Pamela Bass details life in the Oxford Apartments of Milwaukee before and after the revelation of Dahmer’s gruesome activities. Detective Pat Kennedy relives the interrogation and the confession, along with his own moment in the local celebrity spotlight. And medical examiner Jeffrey Jentzen discusses the domino-like discovery of forensic evidence, including the contents of Dahmer’s infamous refrigerator. Bridging the gaps between sound bites and talking heads are actor reenactments of the more mundane moments in the killer’s life, from purchasing goldfish to drinking a beer outside a carnival. To further detail the contents of the film and its narrative structure, it is worth first discussing what “The Jeffrey Dahmer Files” is not. As a documentary, “The Jeffrey Dahmer Files” is not a crash course on Dahmer’s murder timeline. The film assumes at least a vague foreknowledge of the criminal and his crimes. Forget the generic montage of slow zooms on high school yearbook photos. Most of the victims are not even named and many of the related dates, details, and facts of their murders are never mentioned. This is not intended as a history lesson. As a dramatization, “The Jeffrey Dahmer Files” neither glorifies nor sensationalizes the violent aspects of Dahmer’s life. Of the one murder that does occur during the course of the staged scenes, it takes place offscreen. The focus is instead on a depiction of normalcy, and the man’s unnoticeable behavior. Actor Andrew Swant portrays Dahmer not as the monster he was, but as the average person he also could be. And it is this aspect of the man that two of the three interviewees explore by telling their own stories. Save a few brief “average man next door” anecdotes from Pamela Bass, the film focuses almost exclusively on the immediate aftermath and investigation following Dahmer’s arrest. It takes close to forty minutes for the movie to really start rolling and then, like Dahmer shedding his Everyman façade, the film reveals its true nature. “The Jeffrey Dahmer Files” is really an examination into the psyches of its three interview participants. The central focus is away from procedural details on the grisly crimes themselves. Instead, the examination is of the effects on tangential characters immediately affected by the discovery of the serial killer’s deeds. Medical examiner Jeffrey Jentzen is clinically factual. He deals in scientific details and to the point remarks about the case. Neighbor Pamela Bass is candidly honest. She stands out as the heart and emotion of the film. Most interesting are her recollections not of Dahmer, but of how living in the same building affected other residents in the wake of national headlines. Rubberneckers swarmed the complex offering money to sit on the same couch as Dahmer or to hold a glass that he once held. With no other outlet for venting, victims’ families descended on the building to berate residents for perceived inaction. The toll on sleep, state of mind, and the displacement of community when the building was destroyed show how Dahmer continued to chalk up victims after incarceration without even wielding a knife. Detective Pat Kennedy is still mesmerized by it all, even nearly 20 years later. There is an evident sense of wonderment in his recollections suggesting that perhaps he was too intimate with his Dahmer-related interactions. He spins into a fascination with fleeting celebrity status and then finds a life as lonely as Dahmer’s when he is forced to return to a routine of anonymous normalcy once the case closes. For having only three interviewees, the movie uses the well-balanced trio to paint a particular picture. Their thoughts and words work together because of their different insights and connections to the story. From Pamela Bass struggling to reconcile her pre-crime discovery relationship with Dahmer to Detective Kennedy questioning himself for having empathy with the killer, the film depicts them trying to understand not just Dahmer’s actions, but also their own reactions to the situation. The accompanying dramatizations depict an average and solitary life for Dahmer. And while they help to show Dahmer as the man that Bass and Kennedy remember, they are not satisfying on a cinematic level. An entire film about that side of the man would be brutally boring to watch and it is up for debate as to how much value they add to the documentary. Light on content with just over 70 minutes between opening and end titles, “The Jeffrey Dahmer Files” is for those interested in a look at serial crime from eyes other than the killer or his victims. For that same reason, it is also why the film is not a huge trove of factual revelations or compelling insight into the subject of the title. 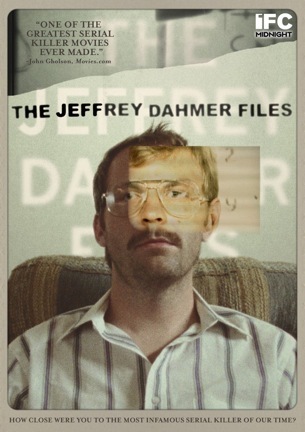 In that regard, the title is almost misleading as to what “The Jeffrey Dahmer Files” truly offers. The audience will not walk away with bullet point factoids or increased knowledge about the killer, but they will walk away with perspective on the Everyman personalities affected by the aftermath of his crimes. July 2, 2013 by Ian Sedensky.